West Coast Turf's newest grass technology for Arizona! Do you want to try something different? Do you want to use the newest in turf tech for home lawn, sports field, or golf course that both saves precious water, and uses less fertilizer? Do you want to do all you can to protect our environment, and still have a gorgeous oxygen producing and carbon absorbing turfgrass? Then Platinum paspalum sod is for you in California, Arizona, and Nevada! Platinum is an excellent homeowner friendly grass that does not necessarily need to be overseeded or fertilized heavily, and can save money over the course of the year when properly maintained. Paspalum grasses require special care--check out our Platinum Paspalum Grass Maintenance page for more info. Platinum has a bright green color, with a medium-fine texture. It is ideal for warm climates. Paspalum will go dormant in cooler temperature months, but may be overseeded for winter color. For the ultimate in water savings, forgo overseeding and use our Endurant TE™ to paint your Platinum during the cold of the winter and save on watering and the cost of rye overseed! Ask our customer service turf experts about this new technology, which makes your WCT Platinum sod the most environmental choice available. If you have a specific question about Platinum, feel free call or to e-mail for answers. Paspalum has a shorter dormancy period than EZ Turf, BOBSod, Tifway 419, and 328. It can transition up to a month quicker than some bermudas. Platinum will handle hard frosts better than the bermudagrass and maintain some color throughout the winter period. Leaf texture on Platinum seems very similar to BOBSod/Bull's-Eye Bermuda, but there is a waxy-wet look shine to the leaf blade on one side and more of an upright growth pattern. Platinum can be maintained at heights of ½" to 2" but is most successful around 1 ¼". The fertilizer and water requirements have made it a very popular grass, as it seems to dislike nitrogen and thrives on organic materials such as milorganite. The watering schedule can be very different than a bermudagrass in that it seems to tolerate stress better than bermudagrass on a 3-4 day watering schedule. (5-10 minutes per every day not watered). Organic type fertilizers maybe used to help keep water bills down. Platinum is very prone to scalping with excessive water and fertilizer so it is best kept to a minimum. Platinum will thrive in soggy soil with a wide range of pH from slightly acidic to extremely alkaline. It will tolerate salty soils, and does well with saline water, or recycled water. Platinum is drought tolerant. It has a very deep root system that allows it to hold moisture for longer periods of time than many other turfgrasses. In the right conditions, it can go for several days without irrigation. Deep infrequent irrigations are best during the growing season. Some broadleaf weeds can be controlled with a saltwater solution, instead of herbicides. Wear and traffic tolerance has proven to be excellent with Platinum. Pet damage recovers quickly due to the density of the grass and aggressive spreading of stolons. Platinum overseeds and transitions well. It does not seem to have as much problem with the ryegrass competition as the bermudagrass can. 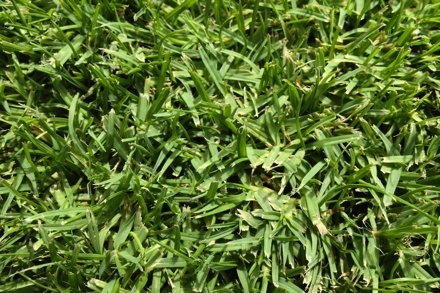 Platinum might tend to get a bit thatchy, so like bermuda, it is best to do 2 light verticuts during the growing season, or 1 during the season, and 1 before overseeding, should you decide to overseed. With proper care, Platinum paspalum will make your neighbors green with envy! If you have any questions regarding the use or care of Platinum, please call our office at 800/832-8873 or e-mail.